Another mini sales surge like we saw in mid April. Again we will hit last year's sales numbers +- some small percentage. Sales rate of 28.9/business day is identical to last year's 29 at this time in the month, but last year we had 16% more new listings. A small sign of life, but still nowhere near any kind of sensible sales/list ratio. In the boom times this was around 75%, while in the 90s flat market it bounced between 50% and 60%. In other news we bought a house. Just some reposted links (thanks koozdra) to get rid of that dreaded "newer" link. Transition from low interest rates will be painful. Nice to see they're at least aware of the problem, but it remains to be seen whether their actions to reduce risk will do so, or tip the market into the ditch even faster. 1/3 of Canadians living paycheque to paycheque. Not much detail there, but apparently the people that aren't saving are of various income levels, so it ain't just those scummy renting ne'er do wells. Mortgage brokers suddenly concerned about rental rates. Won't someone think of the renters! Zoocasa.com has launched in Canada with MLS listings. 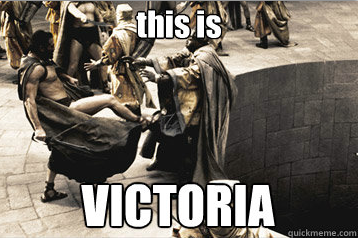 Only Toronto so far, but apparently Victoria is in the next group of cities that will get the MLS upgrade. Finally some competition in this space and the CREA are going to have to aggressively move to modernize their site to stay competitive. Zoocasa seems to have quite an odd business model based on collecting money from agents for referrals, and then giving some of it back to the buyer. I wonder how that will integrate with the business model of discount reduced commission realtors? We won't hit last year's sales but listings are down to match, Looks like MOI will be lower than last year again. 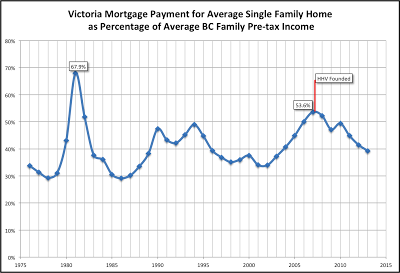 Amazing how interest rates have continued to come down and improve affordability. Final nail: will the Dippers kill the market? Polls just closed. I'm calling a NDP majority government, probably by 15-plus seats. Everyone Knows™ that Dippers are bad for business, bad for the economy and especially bad for housing. I have it on good authority that their first order of business is to pass a law that gives common-law property rights to any basement suite dwelling tenants who stay put for longer than 6 months. They plan to unionize realtors. It's true. They're not satisfied with the economic-rent seeking monopolies of the past. Uh uh. Commision sales people deserve a living wage after all. Especially in high rent markets like Vancouver. To pay for it all, the property transfer tax is going up--after all, everyone knows only people earning more than $150,000 per year and corporations can afford to sell homes to buy new ones today. This won't effect you and me and the rest of joe middle class public because we're selling our homes to co-op associations and staying put regardless... no tax implications there, just unicorns, ponies, free money and low rents. Besides that, us degreed folks are going to head back into Skills Training Programs so that we can have lucrative skilled trades careers working in "public relations" for the Ministry of Information helping people understand why it's important that government mandates be changed from 4 year terms to lifetime terms because short terms lead to bad decisions for "the people." 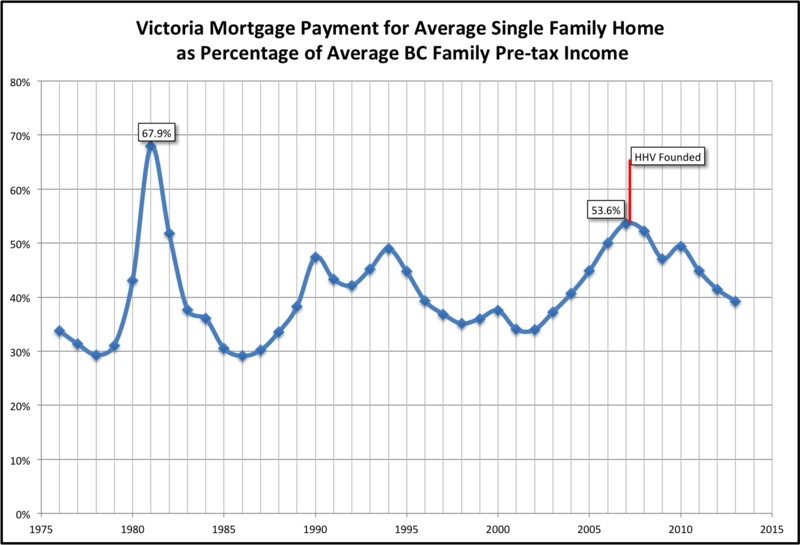 All kidding aside--surely some folk in BC feel the need for comic interlude regardless of election outcome--I'm curious to know what people in Victoria think: will the outcome of today's election have an effect on tomorrow's home prices? Sales are pretty slow but new listings are lagging. "I heard the market is slow out there honey, lets sell next year." In other news, as already linked by koozdra, OSFI is considering restricting amortizations over 25 years. It sounds like it won't be quite so sudden as Garth announced, that they will ban longer amortizations this week, but they are looking into the issue. The last time regulations were changed there was talk about public consultation as well, but it turned out that their mind was essentially made up and the regulations went through very similar to how they were initially announced. Personally I think this is a very strange move from the OSFI. Are 30 year mortgages with more than 20% down really a big risk? If this is part of the push to slow housing, it seems like there are so many more effective ways to put the brakes on, like raising down payment requirements by a couple percent, or banning "skip a payment" schemes and pushing on the provinces to bring the credit unions in line with the regulations affecting the national banks. What this shows is the government's determination to crack down on the housing market. Just like government intervention to loosen credit during the boom wasn't predictable, these interventions to tighten credit availability may continue to come out of thin air. As CMT says: "There’s every reason to suspect that the DoF will keep applying air brakes until the housing plane has no more lift." The flat landing is what every legislator dreams of when the market gets bubbly, and what every real estate spokesperson claims we are in as markets decline. It's something we have some experience with here in Victoria, since it is widely known that our last correction turned out to be this flat landing for the better part of a decade while wages, interest rates, and housing policy caught up to inflated prices. But how flat do prices have to actually be before we can call them flat? Our resident halibuts have a heavy hand on the straightedge, and tend to call anything within ~10% of peak flat enough to pour the foundations on. I've been measuring decline from peak based on the 3 month smoothed median, by which prices are down about 10% so far. 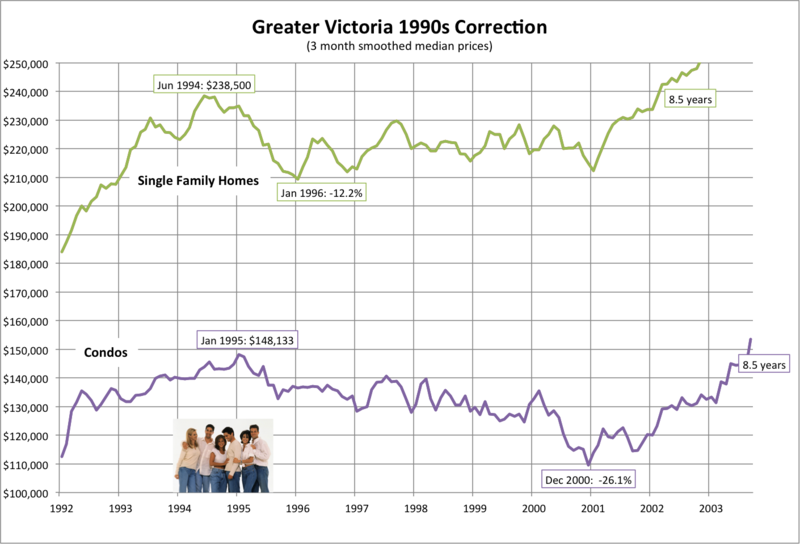 So how flat was the correction in the 90s really? Well from our current lofty vantage point, it looks pretty flat. What if we apply our same 3 month median measure? 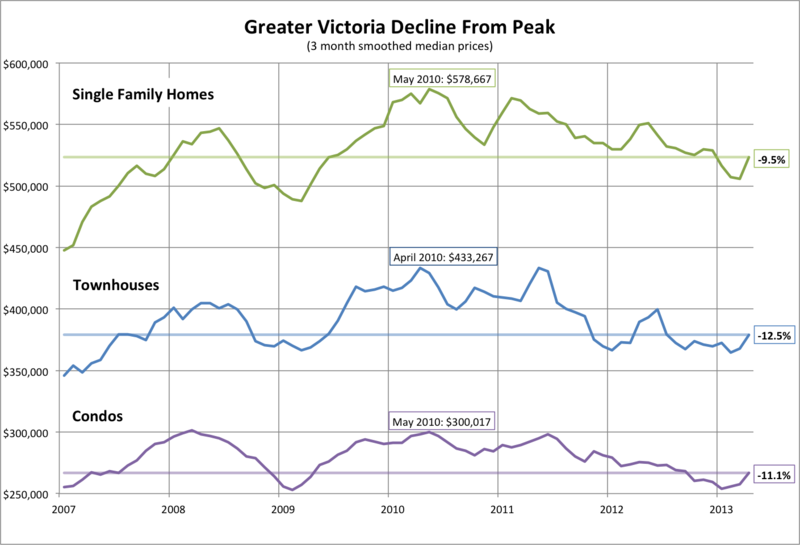 Clearly detached homes fared the best, with peak drop only 12%, and values mostly hovering at less than 10% under peak for 7 years. Condos got a worse deal. Hit with a double whammy of the correction and the leaky condo scandal, they continued to decline to a peak drop of over 25%. That might kick them out of the flat landing category. 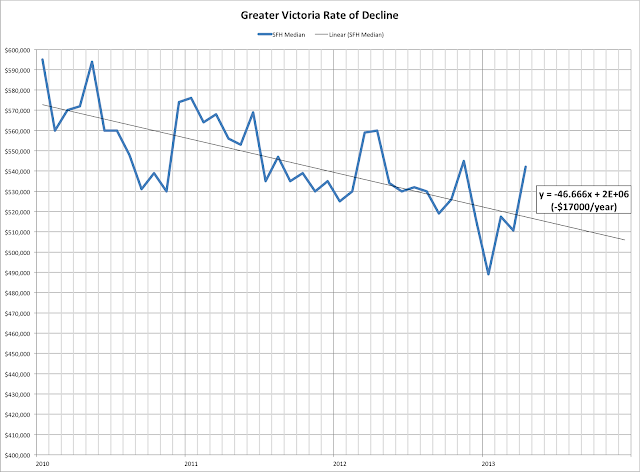 If we're going by percentage corrections, then we're still currently within the realms of a flat landing. Of course in the end it's all about the money. 10% in 1994 was only some $20,000 ($29,000 in today's money), while 10% today is over $55,000. So in percentage terms we might still be in flat landing territory, but in terms of lost dollars, we are already beyond our previous correction. Yesterday it was 20 degrees, today it was 22. At this rate we'll all be boiled into the ether by August. In other words, extrapolations are mostly useless since market conditions are changing all the time. However it's still fun to have a look at what would happen... if current trends continue. As we know, the market has been in a gentle slide since 2010, to the tune of about $17,000 a year on the median detached house. Piddling amounts in percentage terms, but in the end our bank accounts are populated with dollars not percents. Sales predictor says 637 sales for May. I wonder what the listings will look like this month. 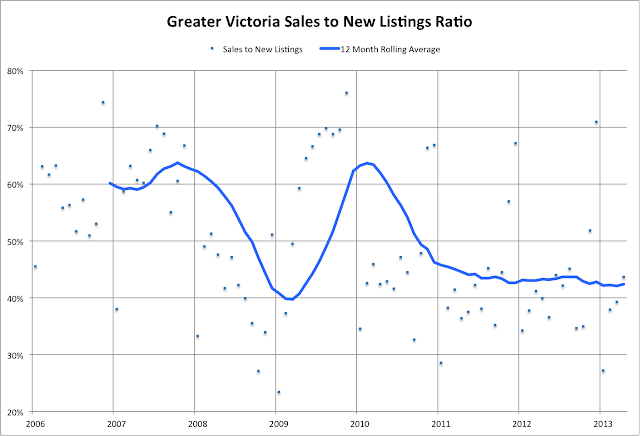 Will we hit 5000 listings or are we past the peak on inventory? Sales have calmed down a bit again, to below last year's pace. 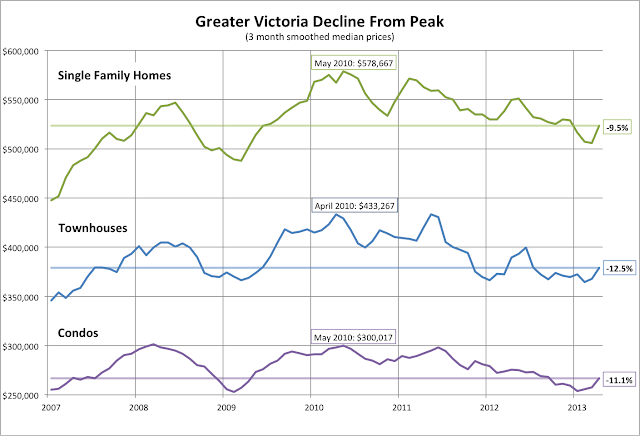 Also, for the rare person that cares about townhouses, I've added that to the decline from peak chart. As you can see it's even noisier than the other charts due to low sales. End of month numbers are in. This month, while overall still very slow compared to other years, was a departure from our previous trend of big year over year drops in sales. Whether it was the elimination of the HST, or the effect of the mortgage changes wearing off, or a blip, we are back to approximately on par with last year's market conditions, rather than significantly weaker. At the same time inventory is slightly lower, for an MOI of 7.5 compared to last year's 7.9. Total sales for the year are still the slowest in well over a decade, and well behind even the last sluggish years. 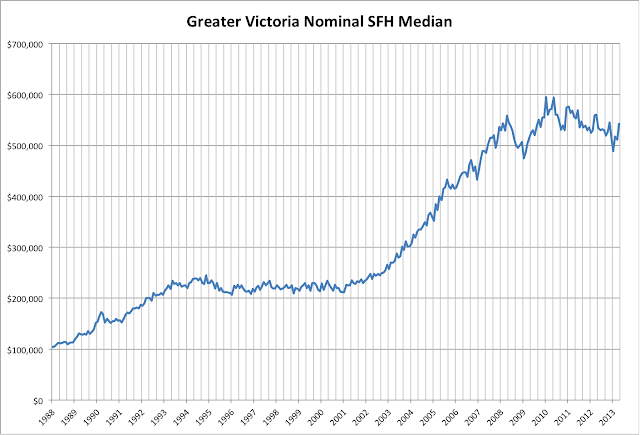 SFH sales up 15% YoY while condo sales are down 15%.